Offer valid on the $49 price point only. Offer not valid on April 9 (Opening Night). Price includes a $2.25 restoration fee. All sales are final - no refunds or exchanges. Offer subject to availability. Not valid in combination with any other offers. Normal service charges apply to phone and internet orders. Performance schedule subject to change. Offer may be revoked or modified at any time without notice. MIRACLE IN RWANDA- a play by Leslie Lewis and Edward Vilga that depicts one woman’s battle for survival during the 1994 Genocide against the Tutsi in Rwanda - returns to New York City this April following an acclaimed world tour. This multi-character solo play stars Rwandan actor Malaika Uwamahoro, and is directed by George Drance SJ. MIRACLE IN RWANDA is based on the true story of New York Times bestselling author Immaculée Ilibagiza (Left to Tell). 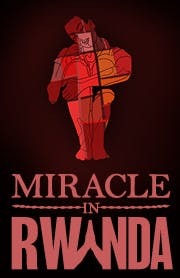 MIRACLE IN RWANDA depicts an uplifting message of forgiveness and compassion, chronicling the dramatic events experienced by Immaculée. The story is one of personal empowerment, of overcoming all obstacles through the power of faith, and ultimately finding peace of mind amidst unbelievable hardship. The true miracle of Immaculée's story is her ability to forgive.